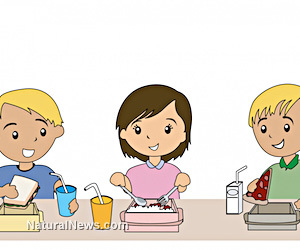 (NaturalNews) Officials at one public elementary school in New York City have turned to brainwashing children into accepting certain lifestyle choices that they otherwise might not if left to their own decision making. Granted, the decision by Public School 244 to be among the first in the nation to offer an all-vegetable menu sounds like a good decision health-wise, but it also contributes to the nanny state mentality that is pervasive in NYC (think Mayor Bloomberg) and growing around the country. Nevertheless, the chancellor for public schools, Dennis Walcott, crowed about the "trailblazing" school, even making a trip there to sit down to lunch with the students. And he admits that, as a fitness advocate, the new menu is just fine by him. "I don't eat fried foods. I don't drink soda. I try not to have sweets too often," he says. "And that's what we want for our students ... to make sure they eat healthy both at home and school." The school's principal, Robert Groff, said kids were gravitating towards vegetable offerings which included black beans and cheddar quesadillas with salsa, and roasted potatoes. "We believe that, if we taught kids to make healthy choices, it would help them to grow as students and well-rounded children," Groff told the New York Daily News. "The founding of our school was based on health and nutrition and teaching kids how to make healthy choices in the belief that they would be more successful academically and in their life," he said in a separate interview with NBC News. "But then we started to watch the kids. One, what they would bring in to school, and two, what they would gravitate towards in the cafeteria." Others who were involved in developing the new menu echoed that sentiment. "We know that when students eat a healthy diet, they're able to focus better. Their immune systems are stronger, so they're sick less, and then they're in school more and they're able to focus and concentrate better, and therefore learn better. There's research about that," Amie Hamlin, the executive director of New York Coalition for Healthy School Food, which has worked with P.S. 244 for years, said in an interview with NBC News. Naturally, Nanny Bloomberg has had a hand in all of this. According to the Daily News, the city's public school cafeterias have undergone a "revolution" in their fare during his tenure, says Eric Goldstein, the chief executive of the Office of School Support Services, for NYC's Education Department. "The ongoing evolution of cafeteria grub has led schools to serve only whole-grain breads and pastas. Salad bars have been installed in 1,000 schools, and they'll be a fixture at all 1,800 facilities by the end of the next academic year," said the Daily News. In a press release, Walcott added: "I am proud of the students and staff for trailblazing this extraordinary path." Bloomberg, you may recall, has made headlines over the past year by calling for bans on large sugary sodas, table salt, plastic foam packaging used for coffee cups, military look-alike semi-automatic rifles, trans-fats and political opponents. Okay, he hasn't officially called for that last item, but you can bet he's considered it.